There are certain vehicles on the market which aim to please by combining two experiences in one. The Polaris Timbersled is called a “snow bike” and blends the best elements of a snowmobile and dirt bike in one for a riding experience unlike any other on the scene. If you are the proud owner of one of these innovative vehicles, there are few basics you should know regarding Polaris Timbersled maintenance. Let’s take a look at the top 10 things to look at for maintaining this unique vehicle. The most important aspect of Polaris Timbersled maintenance is to check for ski damages on a routine basis. The skis are one the most important parts when you are out riding to ensure you get proper traction and control as intended. If the skis are damaged or in need of repair or replacement, you run the risk of further damaging your ride, experiencing a lack of performance while riding, or an accident happening due to loss of traction. When dealing with snowy terrains, your skis should be a top concern. You want to check your skis periodically for any signs of damage such as ensuring the ski bolt is tight enough and not stripped, the ski bolt is torqued to the right specifications, there are no cuts or peeled plastic which will interfere with handling, ski rubber isn’t worn out, and that the ski saddle is straight without any bends. The skis affect how the ride handles and can directly impact your safety so this is definitely the top matter when it comes to maintenance. A worn ski skag will directly impact the level of control you have over the vehicle. If this area of the snow bike is worn down or damaged, you run the risk of losing control and experiencing serious bodily harm or even death. Make sure you check your ski skags before every ride and promptly replace them when there is any sign of damages. A typical rule of thumb is that when the skags are worn down to half of their original diameter, they need to be replaced. If the skags are carbide, they must be replaced as soon as any sign of chipping is present. The skis work with the steering system to give you the control you need when riding. When it comes to maintenance for this area, you should always check it prior to a ride by turning the ski manually from left to right to remove any ice packed in there which may interfere with steering linkage or overall steering ability. 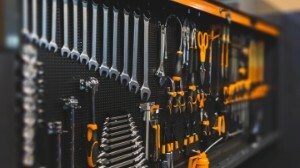 You should also routinely check that your fork clamps, spindle and ski bolts, and front axle bolt are torqued to the recommended specifications found in your owner’s manual. Another important aspect of Polaris Timbersled maintenance is to care for the brakes. You should regularly check the brakes after every couple of rides to make sure there are no issues. An easy way to do this is to squeeze the brake lever and note the way it moves and feels. For instance, the lever should move no closer than half an inch towards the handgrip in most models unless otherwise noted in the manual. If it moves closer to the handgrip than that, it might indicate low brake fluid or air in the hydraulic system. If the lever has a spongy feel to it, you should check the brake fluid. If the brake fluid is at a full level, usually indicated by a black sight glass in the brake reservoir, and it still has a spongy feel when you squeeze the handle, you might have bad brakes, air in the system, or another system error. You should never ride on spongy brakes because it can lead to injury or even death. You should also check the brake pads as part of your maintenance check. The general rule of thumb is that brake pads that are worn down to thinner than 1.5 mm or 1/16 of an inch should be promptly replaced. The track can only be inspected safely when the snow bike is on a hoist or lift so this might be something you have your mechanic do, but it should be done at least once a year. Track damage can lead to track failure and result in a loss of control while riding. The condition of your track is usually related to how you ride. If you ride over ice instead of snow, ride at high speeds for extended periods, or don’t properly lubricate the track, you are at a higher risk of damages, and these damages may even void your track warranty with the manufacturer. It’s important to know the suggested steps to prolong the life of the track and then follow them. If you have your own hoist or lift, you should carefully examine every rod on the track to check for damages and promptly replace them before your next ride. The slide rail is designed to help prevent track wear and tear. This rail has a convenient wear limit indicator groove which will show you when to replace the slide rail. The groove indicates the minimum permissible thinness of the slide and if the rail slides are worn to the tip of that groove at any point in the length of the slide, you need to replace it. If you leave the slide rail worn down and don’t replace it after the indicated wear, you will inevitably damage the track. The slide rail also needs proper lubrication to operate well. Snow is naturally the lubricant used during riding, so if you are riding really dense, hard packed snow, you will end up with more wear and tear on the rail which is why it isn’t recommended to ride over hard snow or ice. When riding in deep snow conditions, the deep lug tracks are made to offer more control and operational performance in such conditions, but they can take on damages, especially if you ride over hard ice, low snow, or hard packed snow at high speeds. You should regularly check the deep lug track for any signs of damage such as tears, bends, or thinning. You should frequently check the nuts and bolts related to your suspension. Any worn or loose aspects can lead to accidents and damage to the system overall. You should carefully check the suspension mounting bolts, rear idler wheel bolt, and rear idler adjusting locknuts before every ride to make sure they are tight and in good condition. You should also check the front torque arm limiter strap condition for any signs of damage prior to riding. The chain should be lubricated after every 8 to 10 hours of riding. It is recommended to hoist the track off the ground, start the bike, and put it in first gear allowing the clutch out to spin the drive system. From that point, you should spray lubricant onto the chain rollers and O-rings to completely soak the chain. The movement and slight heat will allow for better oiling of the chain. Finally, you should take care to keep your snow bike clean. If you allow dirt and debris to build up on the bike, whether on the body or the mechanical areas, you are opening yourself up to damages and eventual repairs. For example, not regularly cleaning the body will strip away the paint job while not cleaning the nuts and bolts will lead to buildup and decay. It is important to clean your snow bike routinely to keep it in great shape. "